Demonstrators nationwide took to the streets with the message that Pride has marginalized people of color. All across the country, hundreds of thousands of people spent Sunday dancing, parading, and partying in glitter-filled, rainbow-covered celebrations of LGBT pride. But in such a tense and divisive political landscape, not everyone was in a festive mood. Activists involved with the Black Lives Matter and No Justice No Pride movements protested the annual commemoration of the Gay Rights Movement this year, arguing that the LGBT community has not made enough of an effort to be inclusive toward people of color and that police involvement in the festivities made it an unsafe environment for minorities. Some marches were delayed for hours as protestors formed human barricades, setting up memorials for black victims and requesting moments of silence. Many of these demonstrators were removed by police so that the parades could continue. We refuse to march alongside those who harass and kill us. We refuse to be complicit in a system that exists to uphold white supremacy at the expense of Black and Brown lives. There is no pride in policing. New York’s branch of Black Lives Matter released an open letter to PRIDE organizers, the Gay Officers Action League-NY (GOAL-NY) and the New York Police Department explaining their decision not to participate in Pride this year. They also wanted the events to focus more on queer and transgender black communities in a movement that has often been criticized for being centered around gay white men. “There’s a broad concern among LGBTQ folks, especially people of color, that this movement that claims victory around marriage equality has very much left behind those of us who still experience marginalization,” No Justice No Pride organizer Angela Peoples told CNN. Four black LGBTQIA people were arrested at an Ohio Pride parade after staging a protest. These resistance groups also took issue with some of Pride’s corporate sponsors who have political leanings or investments (like in the Dakota Access Pipeline and privatized prisons) that they believe are discriminatory. Many Pride participants were respectful of the protests, cheering them on and participating in their requests for seven minutes of silence. Others, however, felt that the disruptive groups were unfairly targeting an ally, rather than the enemy. No Justice No Pride Seattle #NoJusticeNoPride #SeattlePride #Pride2017 As queer and trans people… * We are not proud of Wells Fargo, Chase Bank, and Bank of America’s participation in Indigenous genocide and investment in projects that pillage the land and contribute to climate change. * We are not proud of governments like King County that choose caging our disproportionately Black and Brown youth over investing in their futures. * We are not proud of medical establishments like UW Medicine and Kaiser Permanente that make it optional for providers to be Two Spirit, queer and trans competent. * We are not proud of corporations like Boeing that assemble war machines that lead to the deaths of Black, Brown, Two Spirit, queer and trans people all over the world. * We are not proud of corporations like Microsoft and Amazon that are in large part responsible for gentrifying this city and displacing Black, Brown, queer, trans, and disabled people. * We are not proud of the Seattle Police Department, which enacts police terrorism on communities of color, which makes many in our community afraid for our lives. �We are against corporations marching for human rights who are directly participating in assaults on human rights. We do not buy into Seattle Pride’s vision of LGBTQ diversity and inclusion, which gives a pass to companies and governments to make money off of poisoning people, locking people up, and paying people unlivable wages. At the same time, we are in solidarity with workers at these companies and look forward to working together to build toward a world where we are all free. Angelo’s opinion does not appear to be in line with most representatives of the PRIDE community. NYC PRIDE spokesperson James Fallarino said that they chose to authorize arrests after allowing the demonstrators to protest for ten minutes. 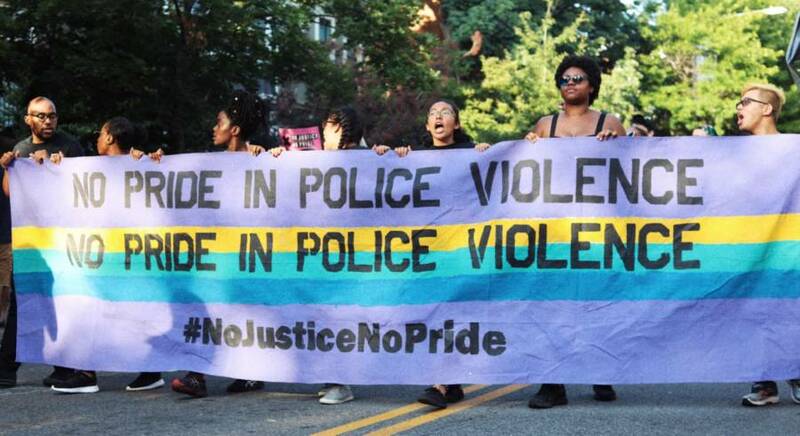 PRIDE’s very origins are based in fighting police brutality, since it began after New York’s LGBT community rebelled against law enforcement during 1969’s Stonewall Riots. Next, read about a revealing poll on how white people feel about Black Lives Matter. Then, learn about police officer who instructed drivers on how to run over Black Lives Matter marchers.